Recently I’ve become more and more interested in using only traditional tools and methods in my calligraphy work. To that end, I decided to make my own traditional lamp black calligraphy ink. This is the ink that was used by Ottoman and Arab calligraphers for generations, and, because of its simplicity and purity of ingredients, is completely light-fast, archival, and permanent. These instructions were given to me by Mohammad Zakariya, the foremost calligrapher working in America today. Very helpful and friendly guy, too. Lamp black ink is so named from the method by which the pigment is obtained. The black carbon is a by-product of kerosene lamps, and is obtained by either waiting until a lamp has burned out and leaves a black coating on the kerosene well, or by holding a ceramic plate over the flame and collecting the soot that accumulates. This is mixed with a gum arabic solution, and distilled water. There are several recipes for lamp black ink floating around the internet. Any recipe that calls for egg yolks, honey, milk or anything other than lamp black, gum arabic and water is worthless. Those ingredients add nothing to the ink and only introduce impurities and potential archival problems to your ink. As I mentioned, there are only three ingredients needed for this ink: lamp black, gum arabic, and distilled water. You can only use distilled water, if preservation and conservation is an issue for you. Don’t use bottled water, don’t use purified water, definitely don’t use tap water. All of those have added chemicals and minerals in them that contaminate your ink. When it comes to the gum arabic, dissolve enough powder in distilled water until you have a syrup, thick enough to coat your finger when you dip it in. 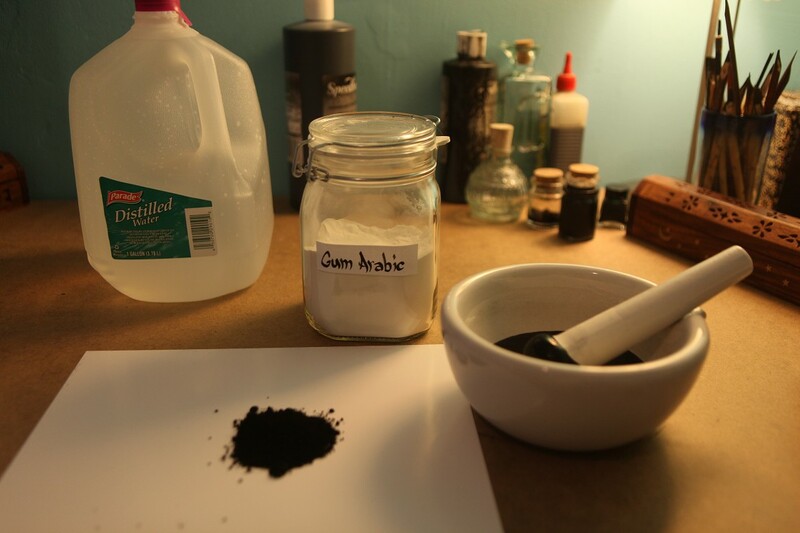 Once you have a bottle of gum arabic syrup and a good quantity of lamp black (I bought a pound from Graphic Chemical and Ink Co.) mix the two together in a stone or ceramic mortar and pestle. You need a big one with smooth sides. A Mexican molcajete won’t cut it, the stone is too rough. The powdered pigment will resist getting wet, so it will take an hour to even get it all wet. Add more pigment little by little, until you have a thick, tar-like paste. This paste needs to be mixed by hand in the mortar and pestle for as much as 30 hours, until all the little granules are completely smoothed out and the paste is completely uniform. If you let it sit for an hour or two, often times the little clumps of lamp black will rise to the surface. I put on a few movies and just sat there for hours grinding away. After that, once the paste is totally smooth, add it to a blender and add distilled water, bit by bit, until you’ve got an ink the consistency of whole milk, not water. Mr Zakariya recommended keeping it in the blender for a week, and buzzing it about every waking hour for a minute, all week long. ~ by Josh on April 28, 2010. 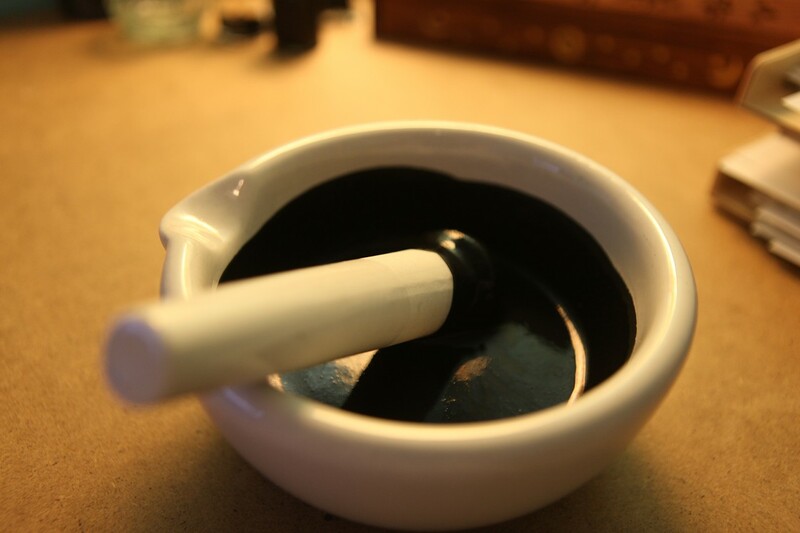 For making the Lamp Black ink, should the ceramin mortar and pestle be glazed or unglazed with glazed upper sides. Thanks for the recipe. I’ve made the ink, just wondering about the viscosity, flow and tackiness of the ink, cos what i got right now just barely grips the paper and a bit ‘clingy’ to the pen. In my anxiousness, i did cut short the “blender” part to only 2 days instead of a week. I’ve kept to your instructions but used a store bought art supply liquid gum arabic with a ratio to almost 1 : 1 and a half of lampblack blended with distilled water to the consistency you’ve mentioned. I add two or three drops of water in my inkwell when i write. How can i buy or order some good quality black ink, raw silk and paper? Does this mean that the ink after preparation looks bluish? I see that you have a perfectly black colour ink in the picture that you have posted.